1. Make it about KYE. I didn’t want to go overboard with all kinds of cute little decorations and junk. I LOVE that type of thing but all that work and stress and who is it really for?!?! Kye surely doesn’t care if we have hand made chocolate golf ball party favors (two words: NEVER AGAIN!). All he wanted to do was play with his friends and eat cake! 2. Keep it cheap. I really, really wanted to cut down the guest list. We invited close to 60 people. 19 kids. We had 42 people total rsvp yes to coming. Um. That’s a LOT. My husband gives me a party budget but then doesn’t let me cut down on who we invite (it’s sweet of him, he doesn’t want to hurt feelings) so we had a talk about how inviting the world to a party means that we have to FEED them all and that the food portion can’t count as my party budget. I’m REALLY proud of myself for how well I stuck to both of my goals. Honestly, it’s the first event I’ve hosted where I didn’t feel stressed at all (at least until the weather reports started coming in…then I panicked but prior to that I was totally at ease). 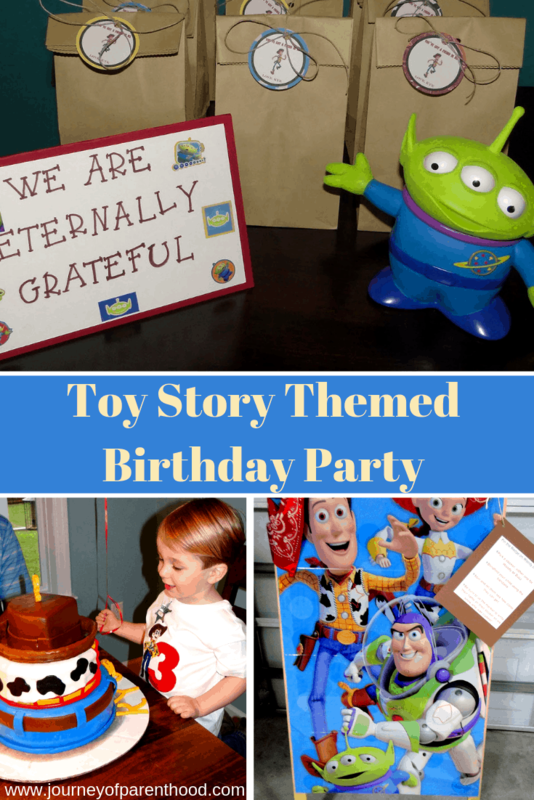 Here’s the decorations that went along with Kye’s Woody Party! Most of the ideas we came up with on our own…I thought Pinterest would be mega helpful but it wasn’t. There just aren’t that made parties that are based around Woody. Most are ALL the Toy Story characters! My mom has REALLY great handwriting. I honestly feel like her writing skills adds SO much to the party decorations each year. She’s awesome!!! We did this sign for the front porch. Originally we planned on having these signs all around the backyard like we did last year for the activities…but the weather changed all of our plans so this was the only “yard sign” we used and we put it in the plant on the porch! The party was from 4-6 and Britt would be napping at 4 so Mom and I made this sign to stick on the front door so people would know to walk in and not ring the bell…didn’t want to wake the baby! (Who btw slept AMAZING!). I make a birthday banner every year for Kye and will probably always do them for my kids! I really love how cute they look and it’s a BIG crowd pleaser as I always get lots of compliments on them. I’ve done so many of them that I’ve pretty much perfected how to make them and wrote a tutorial that you can read here. It really is very affordable and EASY to do yourself!!! It was hard to get a good picture of the whole thing! I bought the die cuts on Etsy (from this store) and they added a little touch of Woody to things! My Dad and Audrey sent this HUGE Bullseye for Kye’s birthday present so he guarded the gifts. We also had Kye’s birthday slideshow going on the tv. I like for people to have something to watch and it’s always something everyone enjoys. I also downloaded a Toy Story soundtrack on I-Tunes and we hooked up my ipod to our home intercom system. It worked great and Kye LOVED it. We had the music playing the whole morning before the party and he kept commenting on the songs and how they were his party songs. I like the idea of getting the party guests involved in the theme. I did a LOT of ordering from Oriental Trading Company this year (and they were great to work with…when I had stuff to return they just told me to keep the stuff and they refunded me my money. Um awesome!). I bought cowboy foam hat kits and planned to do an activity assembling them all but when they came I realized they had to be hot glued. Zach bought the bucket at Lowe’s for like $3 and I thought it was perfect! We have a table in our foyer right when you walk in so I decorated it with pictures of Kye from his invitation photo shoot as well as ones from when he met Woody and Jessie at Disney World. Zach and I decided to have all of the food be related to characters from the Toy Story movies. Yes, it was a Woody party but Woody’s friends had to be invited too, right?!?! btw it’s the first time I got to use MY own cake stand for an event! Super pumped! Jessie’s Juice…I’m anti-juice but what else do you give the kids at the party to drink? Barbie’s Dream Delights aka chocolate covered pretzel clusters (which I happened to start coming down with a stomach virus WHILE making them so even the thought of them makes me feel sick now. Zach had the great idea to use a pizza box and put Bagel Bites in it for little pizzas representing Pizza Planet. I cut open a paper grocery bag and covered the pizza box then found a Pizza Planet logo online (yay for Google images!) and printed it off. I taped it on the box and it turned out pretty cute! When we started to plan Kye’s party and he decided on his theme ALL he would ever talk about was how he wanted a Woody Birthday Cake. I don’t do cakes. I can make a simple bunt cake, using a box recipe, but that’s about it. I originally wanted to hire a photographer to take pictures during the party so I wouldn’t have to worry about it and I also wanted to see about having a “real” Woody come to Kye’s party but in looking over the budget (I’m telling you I’m rocking out at my goal of spending smart this year) I couldn’t afford those things and a special Woody cake. I decided the cake was the top priority since he had asked for it, therefore, I nixed the other two and just focused on having a really great cake. Kye and I went to a birthday party for a friend back in November and we LOVED their cake. It was cute but it also TASTED good which is so important to me. Who wants a pretty cake that is gross tasting?!?! I talked to Heather, who made the cake for that party, and she agreed to make the cake for Kye’s for me. I got to pick the design and everything! She sent me three choices and I let Kye pick which one. When we knew the rain was going to happen I decided to have a color station. I had sort of planned to do one but then figured the kids would be so busy playing outside that no one would color. Since the activities had to take place inside I decided a color station would be helpful! I found the little etch-a-sketch at a kid’s sale and totally had to use it. I bought the Toy Story stickers from Party City (they had GREAT deals on stuff). I google searched and printed out the color sheets myself and used some yellow buckets I had from another party to hold all the crayons. Our original plan was food inside, activities outside, gifts inside. Our house can hold a lot of people but holding people and activities isn’t really an option. When I thought it was going to rain I figured we’d do the activities on the back porch. It’s big and covered and with our open windows, the parents wouldn’t have to be on the porch with the kids the whole time if they didn’t want to. Well then it was straight up TORNADO weather for the party. The only option we had was the garage. Mom and I made this sign for the door to the garage in the kitchen so people would know where to go! We pulled out all the chairs we could into the garage (from our porch, our bar, and folding chairs from the attic and borrowed some from Mom). Robyn and Matt gave us the rest of their helium tank from Lorelai’s Party and we bought another one (Totally worthwhile purchase! They are like $30 at Hobby Lobby and with a 40% off coupon it’s even cheaper. Local places charge $1 per balloon to fill them and it means you don’t have to run out the day of the party to get it done!). It worked out well because I WAY over-bought stuff for the party. With two kids you don’t get much time to run errands so I opted to buy waaaay too much then return it all (I actually just returned all the left over party stuff to Hobby Lobby and got back $88!). Thankfully I bought a TON of balloons because they came in handy to make the garage a little more party-ish! We used red, brown and tan sheets (Zach bought the brown ones from Walmart but, thankfully, we had the rest) and hung them from clotheslines. We have a good bit of junk in the garage and I didn’t want Zach to have to move it all but also didn’t want it looking junky for the party. This whole set up looked AWESOME! I couldn’t believe it! At first I was super upset that we had to have all the activities in the garage, but it couldn’t have turned out cuter! I found this game from Party City for only $4 and it came with removable stickers. I used Kye’s easel to set it up and typed up instructions on how to play. I saw this idea online and really thought it was cute since one of the phrases Woody says is “there’s a snake in my boot!” In this game kids toss the toy snakes into the boots/bucket. It was the party favorite! I found the boot cardboard cut outs from Oriental Trading and Zach bought a red bucket at Lowe’s to cover. I thought a lasso game would be fun and originally envisioned sticking Kye’s horse head in a bucket and letting the kids throw a rope over it. Zach gets more into his party stuff than he lets on…because he turned the horse head into a legit horse! Kye is at that age where he loves little junky stuff. I knew he’d LOVE having a bunch of little trinkets in his party favors. I wish I could have done them ALL just Woody themed but good luck finding stuff. I did the best I could and found most of the items from Party City. I got stickers, little tossing discs, tattoos (your welcome parents), notepads, roller stampers with markers (another your welcome) and tossed a snake in there since I had so many of them. I bought small paper bags from Hobby Lobby and had the tags specially made from Etsy. I ordered printables and printed them myself then cut them out with a 2″ circle punch. We used the alien and his phrase “we are eternally grateful” and put him by the favors for the kids to take on their way out. This was my first year having favors for JUST the kids and it was a tough call on what kids to include in the favors. I ended up doing all the invited kids and the kids who were over a year old. Babies didn’t get one. Adults didn’t get one. It worked out fine. We did have one older sibling come that I hadn’t planned on and I felt bad I didn’t have one for her but like her mom said, it’s something she has to deal with because it wasn’t a birthday party for her friend ya know? And really, that’s what I would tell Kye too! Although I didn’t go overboard with decor, I thought it all turned out really cute and Kye LOVED having all of this toys around the house and was BEYOND excited for his party. I thought that all of your decor was beyond great! It all looked so cute and flowed really smoothly – considering how quick you guys had to make it work without going outside! I'm glad we survived the day and were able to come! I just wish LL had been in a better mood – haha. She was NOT a happy camper. I'm sorta new to your blog so I don't know what you have done in the past, but I think it was the percet amount of decor! Looks like a lot of fun. Be VERY thankful that you have such a supportive and helpful husband. Most of us (married and unmarried) are on our own with this kind of stuff.